You’ve seen the tutorials, so this project is not likely to blow your mind. 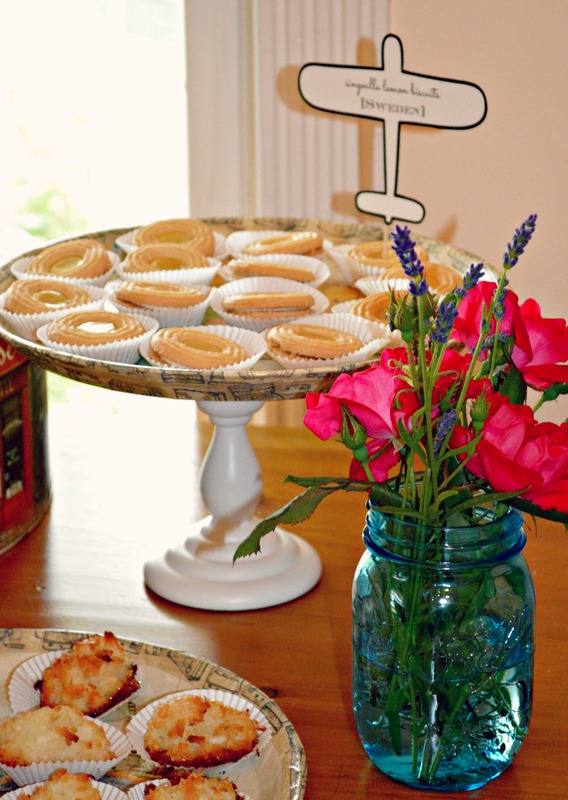 Pretty plates + pretty candlesticks = pretty DIY cake stands. 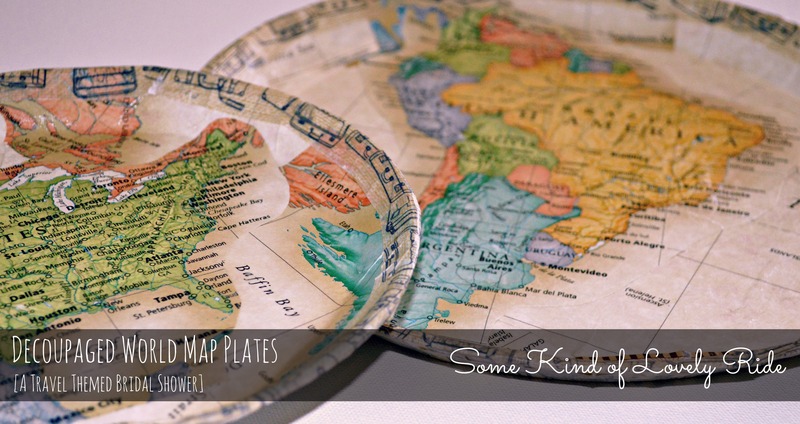 To pump up the unique-ness, however, I decided to decoupage my plates – covering them in pieces of a vintage style world map – to help them fit into our travel theme for our globally-inspired bridal shower. 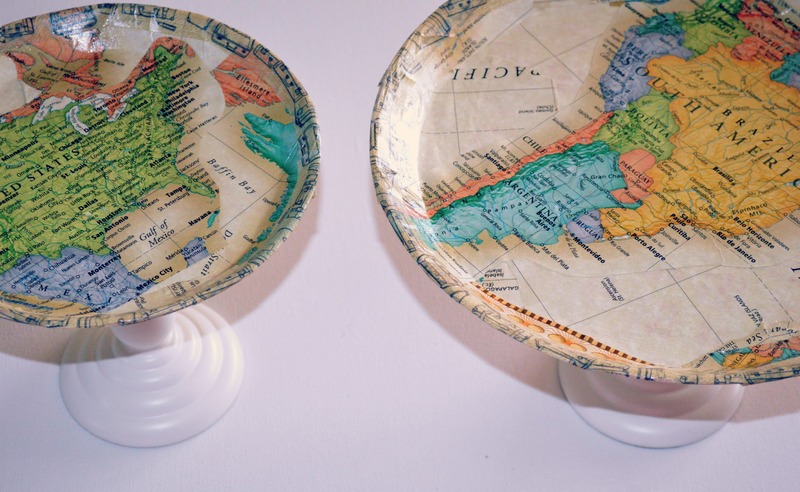 I used some plastic plates from IKEA and a world map purchased from Staples. One map was enough to fully cover two large & one small plate. 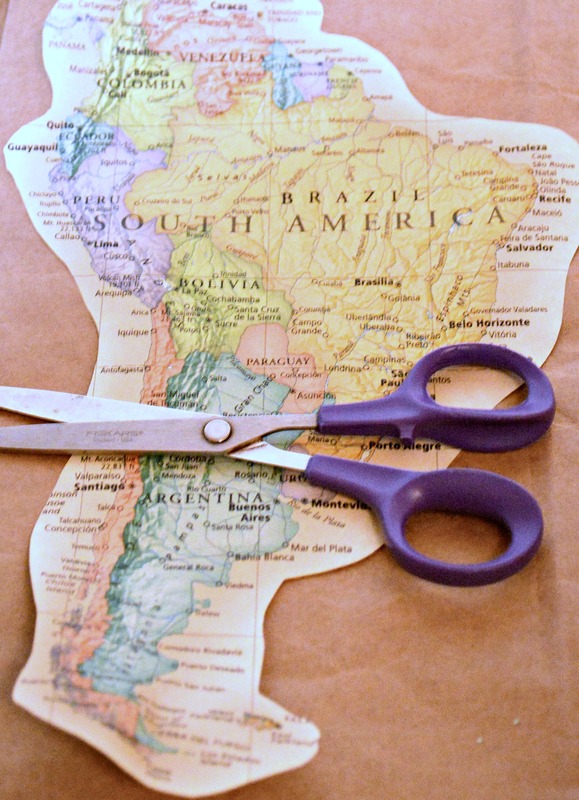 I cut out the three continents that are most significant to the bride & groom – North America (my brother being from Pennsylvania), South America (Priscila is from Peru), and Europe (the couple met in Sweden & vacationed in Paris). 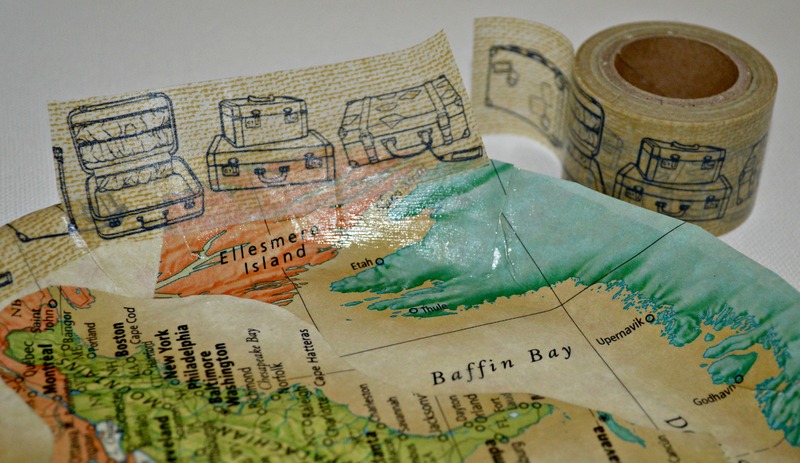 I saved the cut-out-continents for last, and set to work covering the plates with pieces & strips of the map, cut into various sizes and lengths. I adhered all the pieces using Mod Podge. I was peeling the stuff off my fingers for days to come! 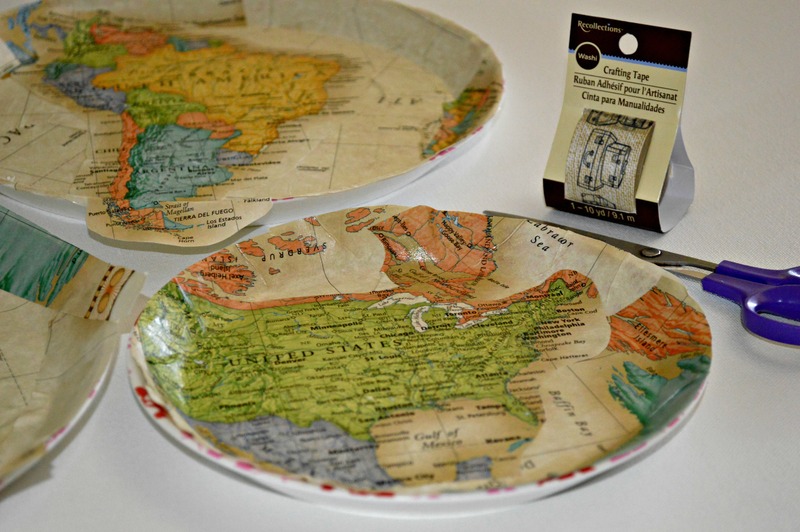 Once I’d covered the edges & majority of the surface of each plate, I placed the cut out continent pieces into the center and secured them down. After failing at wrapping & glue-ing around the edges of the plates (covering round & bendy surfaces is hard!) I decided to save myself some trouble, and use a roll of Washi tape I already had on hand – patterned with suitcases, so it totally fit the theme – to securely cover the edges of each plate. 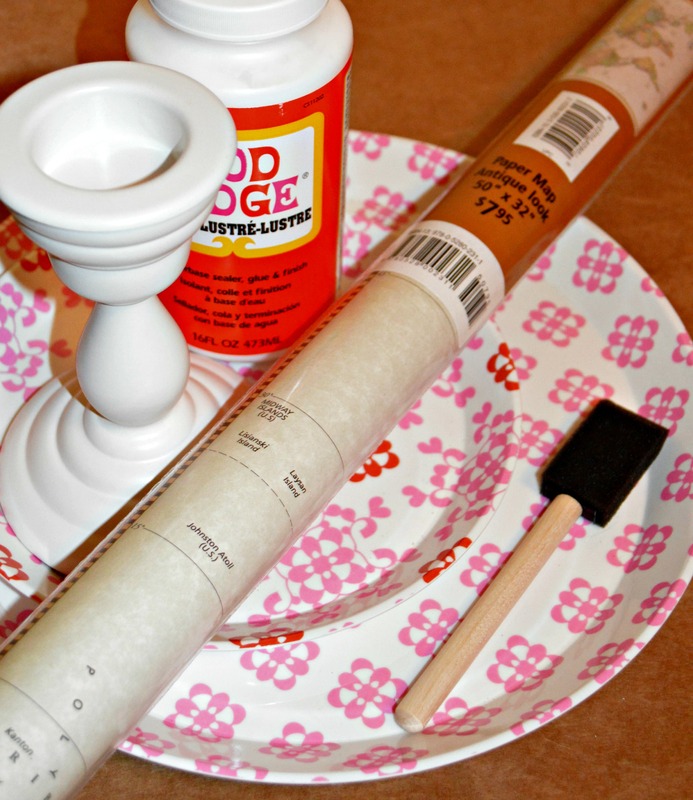 I gave everything another coat of Mod Podge & sprayed the plates with a sealant when I finished. 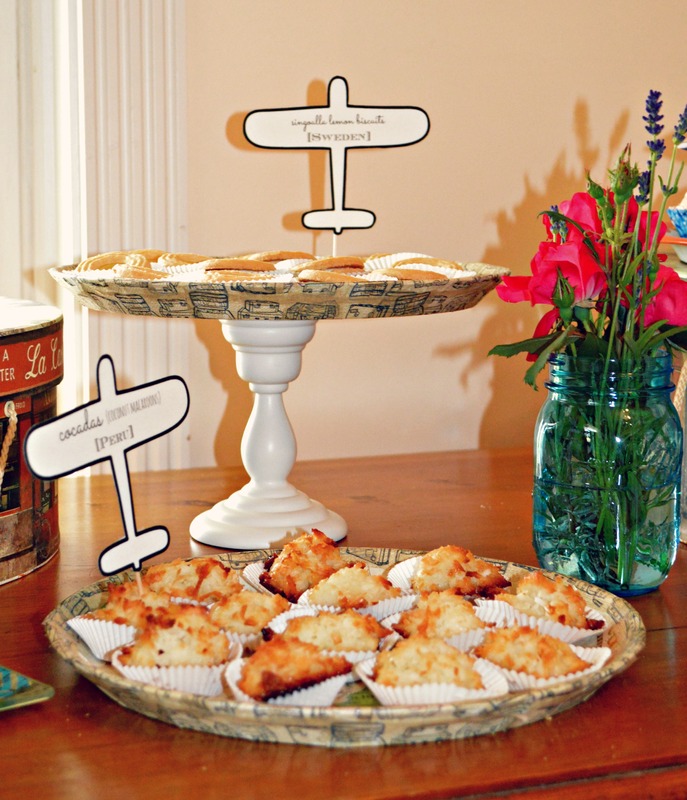 Two of the plates were attached to a pair of white Ikea candlesticks to form raised cake stands. They helped to add some height to our dessert table display! By the way, I made sure that all of the food displayed on these decoupaged plates were in individual wrappers – as the mod podged surface is not really meant for food! I love the old maps you used!